The time is coming for a non-Quebecer to lead the Liberal Party of Canada, says former deputy prime minister John Manley, one of the early front-runners to replace Paul Martin. Mr. Manley broached the controversial topic of successive Quebec Liberal leaders — three out of the past four, 31 out of the last 37 years — during an interview with the Citizen this week. This argument sounds oddly familiar. Where have I heard it before? I wrote about the proportion of political contributions by donor type on January 13th to dispel the inaccurate assertion by Conservative naysayers that the CPC takes its money from Bay street and that the NDP and the Liberal parties are true representatives of the Canadian electorate. As you may remember, I uncovered that the Liberals take the bulk of their donations from businesses and commercial organisations while the NDP takes the significant bulk of their donations from trade unions. Meanwhile, the Conservatives took the majority of their contributions from individuals. At the time, I also compiled the numbers for 2004, the year of the last general election which led to the first minority Canadian parliament in 25 years. The numbers were strikingly different due to Jean Chretien’s political finance reform which limited individual contributions to $1,000 and limited corporate/organization cash to $5,000. 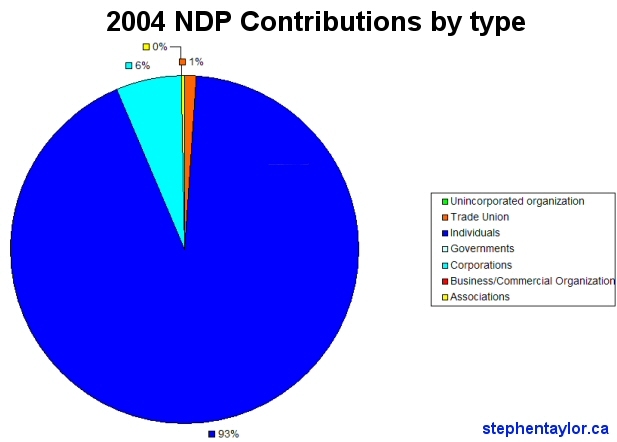 Suddenly, during an election year no less, the largest contributor type to the NDP became individuals instead of trade unions. In fact, even corporate donations surpassed those from trade unions! How could this be? There are many more corporations and small businesses in Canada than there are trade unions. In fact, singular trade unions draw their political power from the ‘solidarity’ of millions of card carrying members. The largest contributor to the NDP in 2003 was CEP, the Communications, Energy & Paperworkers Union of Canada, which donated $909,775.00. Last year, in 2004, they didn’t even bother. 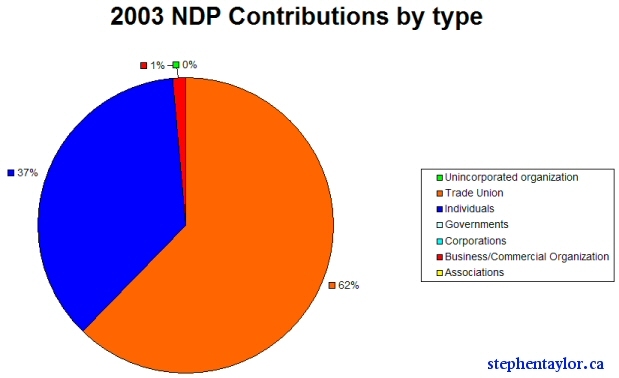 The next largest union contributor of 2003 was the UFCW who donated $775,919.60 to the NDP. Last year, they donated $1,225.00. In fact, the top 10 union contributors (who were also the overall top 10) contributed exactly $4,617,894.22 to the NDP. Last year, union contributions added up to a paltry $15,785.29! Because of the $5,000 cap, the unions were better off telling their members to contribute to NDP individually (which some of them may have, but most probably did not — individual contributions to the NDP, including non-unionized individuals, added up to $1,395,895.41). Also, keep in mind that this $1.3 million represents 93% of the donations received by the NDP last year. What did Jean Chretien do? He effectively capped the influence of organized labour on political parties in Canada (ie. the NDP) and he did so in a very deliberate and neutering way to that party. Neutered financially, however not ideologically, the base of the NDP still exists. Yet without means of accomplishing political change, members of that party must now seek an alternative avenue in which to exert its influence. They will (or, as I suggest, they should) buy up Liberal Party membership en masse to have a significant influence in that party. And why not? Anytime that Conservative Party leader Stephen Harper hints that he might defeat the minority government and thus become Prime Minister, Jack Layton huddles next to the Liberals faster than you can say Sponsorship Scandal. Besides, Jack Layton was either a fool or he was putting on a brave face when he commented that “it’s difficult waking up after election night and finding out that you’re not the Prime Minister”. Assuming the latter, the NDP should soon understand that they are never likely to form a government and realize that their best forum of influence would be directly within the Liberal Party of Canada as members and perhaps as its true ideological base. The effect of this hostile merger with the Liberals would be beneficial to the left and the right. In the wake of the merger, an ideological vacuum would be created on the centre-right which would then be filled by the Conservative Party; fiscal conservative voters that currently hold their nose and vote Liberal would be driven towards the CPC. Meanwhile, those on the left would finally have a voice beyond that of the foolishly optimistic Jack Layton. Finally, all Canadians would benefit from the debate from unambiguously left and right viewpoints without the sullying byproduct that comes with the political sidestepping of third parties. Today was flag day in Canada and this year marked the 40th anniversary of the first ascension of the maple leaf banner up the Peace Tower flagpole on Parliament Hill. To mark the occasion Prime Minister Paul Martin, Minister of Heritage Liza Frulla, Speaker Peter Milliken, and Col. John Matheson gathered at Kingston city hall. Of course, things weren’t as they seemed as I arrived at city hall with a friend. Only a few members of the Liberal association were on the guest list and they were listed as “Friends of Paul Martin”. There were, as I learned, several tiers of invitations such as “Friends of John Matheson”, “Media”, “Other guests” etc. I asked the Heritage ministry staffer at the reception table if we could get on the “invited” guest list. Perhaps, only if some others didn’t show up, she suggested. We decided that it was worth a wait anyways. So, we waited and greeted Mr. Martin after his car arrived at city hall. We then tried to enter the hall again (in the pack of Queen’s Liberals). Yes, we all discovered, three tickets were available. My friend and I were selected from the group of the now temporarily dejected Queen’s Liberal fan club (I saw them inside later, so they must have made other arrangements). We found out that our tickets were somewhat special. Yes, we found ourselves on the list of “friends of Paul Martin” and were immediately ushered towards the front of the auditorium into the front row. Not bad for a couple of non-Liberals (and one de facto conservative) for an invitation only-event. The mayor of Kingston must have also been a “friend of Paul Martin” because he was sitting next to us. Maybe they golf together? The ceremony itself was particularly interesting as we were lectured on the emergence of our red and white maple leaf banner. Apparently Paul Martin Sr. had a hand in outlining the selection criteria for flag designs. The highlight of the ceremony was the recounting of historical anecdotes and minutia from the man who submitted the winning design, Col. John Matheson, a former Liberal MP. The low point of the ceremony was the playing of the Historica minute clip of the process behind John Matheson selecting the flag. The low point came when the actor playing Matheson scoffs at “what the Tories are proposing” as the Red Ensign is displayed. This elicited a loud singular scoff from an audience member who most likely didn’t realize that the Red Ensign was Canada’s flag prior to the maple leaf. Thus, while the man thought he was voicing his knee-jerk disapproval of the Tory proposal, he was instead scoffing the banner under which every fallen Canadian soldier in WWI and WWII died. Sadly, the Historica minute seemed to suggest the Red Ensign as laugh-worthy due to its juxtaposition with the big, bad Tory plan to protect the status quo. It was flag day, after all, and I was there to celebrate and share appreciation of every flag that has represented this country. After the ceremony, the crowd cleared the hall into a reception area where the mayor, the Speaker, Matheson and the PM were socializing with invited guests. 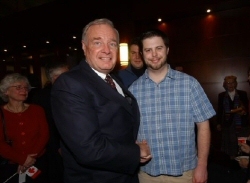 Well, since I was apparently a “friend of Paul Martin” I made my way over to the PM for a photo. The crowd surrounding him was large as every part of it jockeyed into position to say a few words or offer its advice. I met Paul Martin once before when I was in high school when he was campaigning during the 1997 general election. I invited the then finance minister into a chat with some other keener students that had been selected to attend the event. Martin chatted with us for about five minutes on various issues of that campaign, and at the conclusion of our discussion, politely wished us well. Today, time with Paul Martin the Prime Minister was sought after by every person in that reception room from the school children on the field trip to the pensioner with key points of his own plan for saving healthcare written down and passed to Martin. Surrounding the time of our brief handshake and photo, I had the impression that Mr. Martin was, for the most part, passed about the room like a political prop and he appeared to have much more on his mind than the flag day ceremony. While everybody was gathered there to celebrate their common history, Martin looked tired and distracted perhaps by his anticipation of the fractuous future months to come. A plan to set up a tsunami warning system for the Indian Ocean — and eventually the whole world — received enthusiastic support in Kobe, Japan, last week. But observers cautioned that the job is being made harder by a lack of coordination and data sharing between countries. Coordination is necessary both to ensure that resources are not wasted and to avoid potential confusion from conflicting warnings, says Laura Kong, director of the International Tsunami Information Center in Honolulu, Hawaii. “Instruments in the Indian Ocean are currently owned and used by a number of countries. We must ensure coordination and sharing of data,” she says. But so far coordination has been seen as lacking. One US representative, for example, noted at the conference that he had learned more about Germany’s technical plans by talking to the press than from meetings with German representatives themselves. India has also been criticized for not sharing tide-gauge data that are essential for understanding the ocean’s dynamics, and for refusing access to some researchers keen to study the country and its islands in the wake of the earthquake. As we’ve sadly witnessed, tsunamis are inherently international disasters. UNESCO’s Intergovernmental Oceanographic Commission should play the pivotal role in international disaster prediction and detection in this regard and bring all contributor nations to the same table to coordinate their efforts constructively. Paul Martin takes the stand in a few hours, it should be interesting to watch. Jane Taber had to write about it, but you didn’t have to go to Jane to read it. Every newspaper reported it; to them it was the highlight of Chretien’s testimony. Like him or loathe him, Jean Chretien upstaged his testimony yesterday by criticizing Judge Gomery’s small town cheap comment and signature golf balls by pulling out the golf balls of other ‘small town cheaps’ such as Bill Clinton, George W. Bush and even the law firm of Gomery’s daughter. There’s no doubt that he hijacked the inquiry with his political stunt and it is infuriating that it detracts from the pursuit of the truth, yet it was “the best political theatre of the season”. 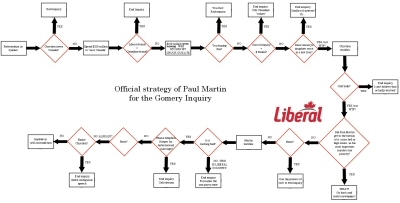 It parlayed perfectly into the embattled ex-PM’s sordid strategy of tearing down Gomery’s image of objectivity. It dominated the news cycle instead of the very fact that Don Teflon Jean was finally on the stand for his potential role in the largest government corruption scandal in Canadian history. It was funny, adding an air of likeability to Chretien’s character in the eyes of the public (whom are generally not paying as much attention to this inquiry as they ought to be). It’s rumoured that Warren Kinsella orchestrated the entire event and for his part in what he does best, I say “Bravo”. Well played. Theatre aside, this is also about justice and if Chretien gave political direction in defrauding Canadian taxpayers for partisan political gain, I hope that Gomery tees him up. About a week ago, I wrote of the hypocritical bias that exists at the CBC, our Canadian State Broadcasting Corporation. While they whined and complained at the mere notion of the arrival of any semblance of parity in debate in this country, I crunched some numbers and found how ‘fair and balanced’ they really are. Today, former Liberal Prime Minister Jean Chrétien testified at the Gomery Inquiry and provided little insight into the political direction which may have directed the program. Tomorrow, Paul Martin takes the stand and will mark the first time in Canadian history, since Sir John. A MacDonald, that a sitting Prime Minister has provided testimony in a judicial inquiry. Well, I just did Paul Martin’s job. I believe that I got to the bottom of the Sponsorship Scandal. 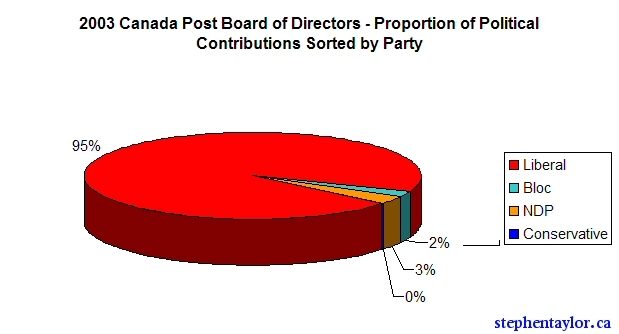 I present the political contributions of the boards of directors of the very Crown corporations which are at the centre of the Liberal mess. I’ll let the data speak for itself. You might not have to be a Liberal to be a Canadian, but to get the posh government jobs you’d better be, and you’d better bring your chequebook. Jean Carle, a former top aide to Jean Chretien and senior executive at the Business Development Bank of Canada, admitted Friday that he helped construct a phoney paper trail to conceal details of a $125,000 sponsorship deal. The blunt revelation from Jean Carle – who is described as having a father-son relationship with the former prime minister and once lived in his basement – places the scandal in the heart of Chretien’s circle of intimates. Carle’s startling testimony, at the public inquiry into the federal sponsorship program, drew a tart observation from Justice John Gomery. “If this were a drug deal, it would be called money-laundering,” said Gomery. “You’re not wrong,” Carle meekly replied. I got an email yesterday from Kevin Steel, a reporter from the Western Standard requesting a telephone interview concerning my CBC Board of Directors “exposé” from January 30th. The interview lasted longer than I ever expected as we chatted about things from CBC bias to the Shotgun to the Blogging Tories. My first media interview with a nationally distributed political news magazine was an overall positive experience (let’s wait to see how it’s written up — but I knew that I was in ‘friendly’ territory). Thanks to Paul for bringing my post to the Western Standard‘s attention, and to Kate too for her recent nod on the Shotgun. This past year, I’ve noticed a significant emergence of conservative media in Canada. I’m hopeful that in the next year, and in years to come, our media efforts will see further refinement and focus from the blogosphere, to print, and to broadcast. At the time of this writing, CNN and the AP are reporting on a US soldier apparently captured in Iraq by terrorists. 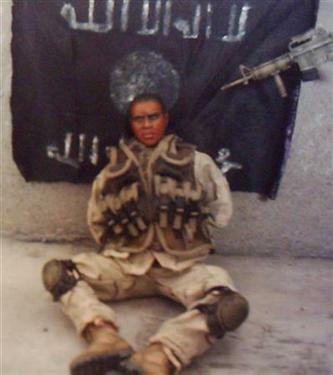 Fark and Drudge have already debunked the story; the “soldier” captured and photographed by the terrorists is just a 1/6 scale G.I. Joe action figure.